Patients love the porcelain bridge because they resemble your real teeth and are extremely durable. Porcelain bridges are used as a permanent measure to replace missing teeth. This piece is non-removable and comes in many different variations, all of which are serviced at Montgomery Dentistry. The most common type of bridge work is the “traditional bridge” where porcelain is fused to metal. This bridge uses your real teeth as anchors to adjoin artificial teeth made of porcelain to fill in gaps. Occasionally, a porcelain bridge may need to be re-cemented or even replaced because everyday wear. If you already have a porcelain bridge and are unsure of its current condition, then call our office to set up a consultation! What are common reasons for needing a porcelain bridge? Giving you confidence in your smile! What is the procedure for receiving a porcelain bridge? The proper placement of a fixed bridge will require a minimum of two appointments. 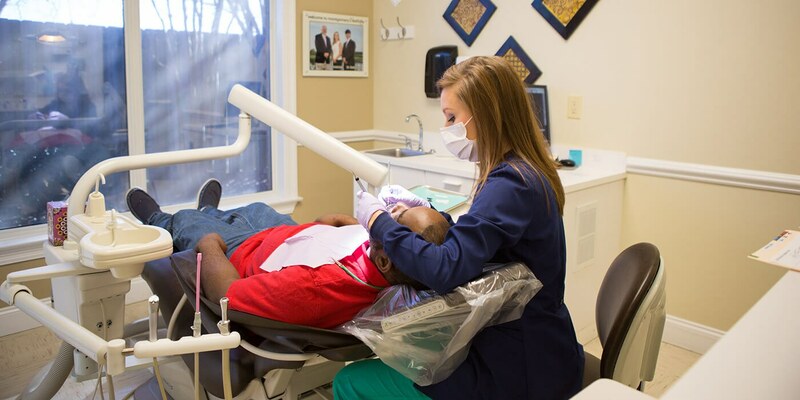 After the dentist applies anesthesia to the area receiving dental work, two of your natural teeth will be prepared for bridge “anchoring.” This means a portion of each tooth’s enamel will be removed so that a crown can fit snugly over the tooth. A mold of your teeth will then be taken so that our dental laboratory can fabricate a customized bridge for you. In the mean time, we’ll give you a temporary bridge to wear for a few weeks until your next appointment with us. The second visit involves making sure the bridge that has been fabricated for you is a great match. Our dentist will take time thoroughly examine the piece and make any needed adjustments. The dentist will then either permanently cement the bridge to your teeth at this time, which is more common, or the dentist will temporarily cement the bridge if it looks like your teeth and gums will need time to adjust. In the latter scenario, a patient will need to come back later to have the porcelain bridge permanently cemented.